As I said in the previous post, I never expected this article to be so long; and now even this third and final part is far longer than I anticipated. In view of this, and to keep the reader’s interest, I’ve decided to post Part Three in two sections. I will post the second section tomorrow. If you missed Parts One and Two, please click on the links below to view. I continued to lay there wondering if I would ever get to sleep again and gradually the other devotees in the beds near to me started to get up. We chatted and I mentioned that I still hadn’t slept; I was also starting to feel guilty that I had travelled thousands of miles to the ashram of “God in human form”, yet I’d not engaged in any meditation or reading of spiritual texts. My new friends pointed out to me that I would not be able to function without sleep and they encouraged me to remain in bed. By now it was 07:00 am and they were all going out into their day. I decided to take the advice, and to my pleasant surprise, I actually managed to drop off to sleep. 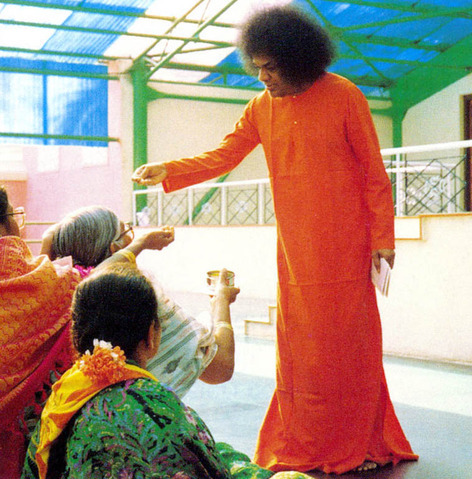 I awoke again around 11:00 am and went for a shower; I decided that I needed to solve the problem of my clothing and have another go at familiarising myself with the ashram. Yes, most definitely the previous day had been nothing short of a surreal nightmare. But having said that, in amongst all the confusion and fear I’d had an incredible inner experience with my loving God man, Sri Sathya Sai Baba. I ventured out into the ashram and immediately I was met with a continuation of the previous day. The heat, the pushing and shoving and the blisters; I was in despair. I felt more and more fearful and vulnerable as the morning turned to afternoon; I was completely lost, unable to make head or tail of what was happening to me. There are little kiosks dotted about the ashram at various locations where you can get a coffee; tiny cardboard cups for 6 Rupees. Whenever I stood in the queue I would have someone come and blatantly stand in front of me, or simply shove me out of the way before standing in front of me. It just helped to pile on the agony. At some point I felt at rock-bottom, and I got myself one of the little cups of coffee, sat down on a wall and started to cry. I felt like I had been reduced to zero; like I had no life of my own. I felt as though I was being worked by a puppet master. Many of you reading this may be familiar with the old Thunderbirds programme, where you could actually see the strings on the puppets; well I really did feel that I was a puppet that was being controlled by strings. I felt as though I was in the grip of a power so mighty, that I had no control whatsoever of my movements. I’d tried to settle myself in to ashram life but at every turn of the corner I was met with a brick wall. As I sat on the wall crying, my life, metaphorically, flashed before me. I felt so insignificant, so tiny and so worthless; like I had less significance than a single grain of sand in the Sahara desert. Everything I’d ever done; all my spiritual work of the previous seven years, in fact, my whole life felt worthless and completely and utterly meaningless. I just did not have a clue what I was going to do. At some point I got up and started wandering around again. I don’t remember when exactly, but after hobbling around for a while I stumbled across the Western canteen by “accident”. I realised that I’d hardly eaten anything since the meal in the South Indian canteen the previous day. I felt ready for some food and thought it might perk me up, but I had no idea as I walked up the pathway that Swami was about to pick me up and dust me down. As I neared the entrance I could see that there was some writing etched into the stone wall just to the right of the doorway. Out of curiosity I stopped to read what it said and it was then that I realised that all my nightmares had been nothing more than Swami’s play. He’d led me along that pathway in order to bring me to this moment. As I perused the writing I just couldn’t believe what I was reading. All of a sudden the penny dropped. I had doubted Swami because I’d allowed my mind and my ego to rule me; now as I read I could see that my beloved Baba had no choice but to use “tough love” in order to help his child. What I was reading was Baba’s Surrender Prayer. If you are not familiar with it allow me to enlighten you. Why get agitated? Let Me take care of all your business. I shall be the one who will think about them. I am waiting for nothing else than your surrender to Me, and then you do not have to worry anymore about anything. Say farewell to all fears and discouragement. You demonstrate that you do not trust Me. On the contrary, you must rely blindly on Me. To surrender means: To turn your thoughts away from troubles, to turn them away from difficulties you encounter and from all your problems. Leave everything into My hands saying “Lord, Thy will be done, you think of it”. That is to say: “Lord I thank you for you have taken everything in your hands, and you will resolve this for my highest good”. Remember that thinking of the consequences of a thing is contrary to surrender. That is to say, when you worry that a situation has not had the desired outcome, you thus demonstrate that you do not believe in My love for you. You will prove that you do not consider your life to be under My control and that nothing escapes Me. Never think: How is this to end? What is going to happen? If you give in to this temptation, you demonstrate that you do not trust Me. Do you want Me to deal with it…yes or no? Then you must stop being anxious about it! I shall guide you only if you completely surrender to Me and when I must lead you into a different path than the one you expect, I carry you in my arms. What seriously upsets you is your reasoning, your worrying, your obsession, your will to provide for yourselves at any price. I can do so many things when the being, as much in his material necessities as in his spiritual ones, turns to Me saying: “You think of it”, then he closes his eyes and rests quietly. You will receive a lot but only when your prayer will rely fully upon Me. You pray to Me when in pain so that I intervene, but in the way you desire it. You do not rely on Me, but you want Me to adjust to your requests. Don’t believe like sick ones who ask a treatment of the doctor, all the time suggesting it to him. Do not do that: But rather, even in sad circumstances, say: “Lord I praise and thank you for this problem, for this necessity. I pray you to arrange things as you please for this terrestrial and temporal life; you know very well what is best for me. Sometimes you feel that disasters increase instead of diminish. Do not get agitated. Close your eyes and tell me with faith: “Thy will be done. You think of it”, and when you speak thus, I accomplish a miracle when necessary. I only think of it when you trust me totally. I always think of you, but I can only help you completely when you fully rely on me. This entry was posted in From The Heart and tagged God in human form, Prashanthi Nilayam, Sai Baba's Surrender Prayer, Sri Sathya Sai Baba, Swami Moves In Mysterious Ways, Thunderbirds, tough love by Bloggin With Rich. Bookmark the permalink. Wow, what a way to learn about absolute surrender / implicit faith from SWAMI. Waiting to read further. Sairam and warm regards.